Amber with her little calf. The pair were first spotted on April 1, 2017 at Blue Spring State Park. There has been a good bit of activity on the webcam outside the season as reported by Cora Berchem, Save the Manatee Club’s Multimedia Specialist. On July 8th, Lucille came in with a very small calf. Earlier we had a summer visit by three generations as Ann (with a new calf), Amber, and Amber’s new calf were in the run at the same time. Amber is Ann’s daughter. This may be frequent in winter but not summer! Other manatees have been in from the past season. Margarito made a short summer visit in April. Some like Peaches are related to adoptees. Peaches was the first calf of our much missed Georgia (Georgia passed away in 2015). We also look forward to reports from Sea2Shore like the one biologist Monica Ross sent on Oria with calf in a nearby spring. Sea2Shore keeps an eye on manatees in many other springs along the St. Johns. One of our newly named and numbered manatees, Oria, that we knew was pregnant showed up at a spring nearby with a brand new calf last week! That is two calves for next season already! The river temp yesterday was 72° F (22° C) and we saw 10 manatees. Today the river temp was 72.5° F (22.5° C), and we saw four. Had to count two in the river to get that many. Only one manatee was recognized, and he was a juvenile, not an adoptee. I believe that is that. No more surprises! Well, we did a roll call and saw 10 manatees. No adoptees, but Amy and her old calf and Amber and her new calf were in, nice! I am thinking this is a special event rather than the continuation of the season. The season was declared over on March 24th with nothing but 80° F (27° C) in the extended forecast, but now temperatures are due to dip into the mid to high forties (5-9.5° C) for three days. We shall be there to check it out. Figures are still not completely firm but we had 533 manatees seen during the season (an increase of approx. 50) and 50 calves. The manatee Lola that we sought so long to capture seemed to be doing well at Miami Seaquarium with amazing TLC, but she recently, and very suddenly, passed away. The first calf of Lucille, Lola was born in 1985. She was 32 when she died. She had 11 calves and nine grands. Two of the calves we are still able to track. The end of the manatee season is definitely in sight. The river temp was 68° F (20° C). Eleven manatees and none were adoptees! No cool weather in the offing. The new thermometers were fine. The river temp was 66° F (18° C). 35 manatees were in, but the only adoptee was Gator. I think the season is within days of ending! With the river temp at 61° F (16° C), 211 manatees were in on Friday. I had expected over 300. Sometimes I do not predict too well! We saw Paddy Doyle, Brutus, Howie, Gator, Doc, Lily, Whiskers, Phyllis, Aqua, and, with the count over, Philip and Lucille showed up! Over the weekend, Cora Berchem, our Multimedia Specialist, saw Doc, Gator, Paddy Doyle, and Lucille. On Monday, the river temperature may have been 65° F (18.5° C). I bought new thermometers on the way home. My count was 68 manatees, including Paddy Doyle, Nick, Lily, and Annie and her calf. The river temp was down to 66° F (19° C) but the air was 32° F (0° C). 252 manatees were counted. This is the third highest count I’ve had in March! A manatee named Mangle was in for the first time this season. Also in were Lucille, Brutus, Doc, Howie, Annie and calf, Whiskers, Gator, Paddy Doyle, Lily, and Phyllis. Lemon and the calf born on or before January 8th were also in today and yesterday. That was good to see. Lemon is nursing the orphan from this season regularly now. That also was good to see. One manatee we were looking for named Swale was in. Instead of laying in shallow water to ease his breathing (breathing four times in a row with a sound like a cow and with his entire head up), he was in deep water and put out just his nostrils and breathed very quietly! I think he is well. Good for Swale! The river at Palatka was 60° F (15.5° C) so I was surprised to find it at 68° F (20° C) at the park. Going out in the canoe, I decided 68° F was probably right. The water was up several inches due to rain to our south. It was very windy, and I was sorry to be out, but did better than expected. I counted 38 manatees. Near the river I found Eris. He looked very strange with large barnacles scattered over him. This was his first day in for the season, so I was happy to see him well. Then, almost a quarter of the way up the run, I found Howie milling about. Right after that, I found Phyllis sound asleep. Then, with the count over and the wind driving me off the run, I ran across Paddy Doyle. So it was a good day after all! Before I left the house for Blue Spring, I checked the river temp in Palatka to see what it was doing. After three days at 69° F (20.5° C), it had gone down a degree. That got my hopes up. With the weather forecast I did not really want to go, but as there was a possible window to take roll in the morning, I went. The weather will be far worse tomorrow! The bottom of the river was visible through the spring water pushing out into the river all around the dock where I get the river temp, so I gave that up and launched the canoe. Gator came to greet me. He had six friends. Most of them were feeding on floating vegetation in the river in front of the run. I estimated the river temp as the same as the run, about 72.6° F (22.5° C). With that, I paddled to the springhead (boil) and saw no more manatees. We shall see what the cool snap brings later in the week. The river temp was 69° F (20.5° C). We saw nine manatees. One was Gator. Three years ago we found a dead manatee in the boil, so yesterday I dove the spring to make sure all was well before swimming and diving opens for the summer. All was well, and I enjoyed it. For the second day in a row, the river temp was 67° F (19.5° C). For the third day in a row, we counted 85 manatees! Annie and calf and Gator were the adoptees that were in. The river temp dropped a degree to 67° F (19.5° C), but we had 85 manatees again. The adoptees were Lucille, Aqua, Doc, and Paddy Doyle. Then when the count was over, Gator showed up. We also ID’d a manatee released in early January near the park for the first time in the run. So we know she has found the run and that is a good thing. She has been hit by a boat since release and will not be so hard to ID in future. Not really a good thing. The river temp was 68° F (20° C). We found the park count of 70 manatees hard to believe, but then we counted 85!! Brutus was in as well as Doc and Aqua. Then, in late breaking news, Gator showed up on the webcam! Cora Berchem, the Club’s Multimedia Specialist, reports the river was 70.5° F (21.5° C). Fifty manatees made the count, including Aqua and Gator. Later Brutus was seen on the webcam chasing the females around. He was in Saturday as well. The river temp was 72° F (22° C) today, and one lonely little juvenile manatee was in. The river temp was 71° F (21.5° C). Twelve manatees were seen and eight ID’d. There were no adoptees spotted. I did an interview with the Sea Rescue film crew about Una who was rescued for line entanglement back in November, and the interview went well. We hear Lola is improving, though very slowly, and she has a long way to go. Lola was rescued for buoyancy problems, and they have found a cracked rib after draining an awful lot of infection out of one of her lungs. The river temp was 70° F (21° C) today. We found the problem with the thermometer used yesterday and now know the river temp yesterday was around 68° F (20° C). Today we counted 29 manatees and ID’d 26 of those. Aqua was the adoptee in today. We now know that Paddy Doyle was seen around 2:00 p.m. yesterday. This just in from Cora Berchem, Save the Manatee Club’s Multimedia Specialist: Brutus was in!! The river temp was taken as 64.5° F (18.5° C). This river temp seems too low to both Cora and I, but it was what she got. By my protocol, Brutus counts as spending the season while only spending two days with us! His summer wounds are healing nicely. Twenty-seven manatees were counted and nine of those were ID’d. Brutus was the lone adoptee spotted. Yesterday two unID’d juveniles were seen in the run and six or seven manatees out in the river. Today the river temp was 71° F (21.5° C) just as it was on Friday. I did a manatee count of seven and ID’d four. None of the four manatees spotted today were adoptees. With a river temp of 72.6° F (22.5° C), I expected about five manatees. Instead I saw 35. As a bonus, Howie and Annie were in! I think they know it will be cooler this weekend. The river temp remains at 71° F (21.5° C). With the warm weather, the manatee count was 16, with no adoptees. It was difficult to get the river temp. It is as if the river has stopped flowing and the spring water is pooling out in front of the run. That is not really true but that is the way it seemed. We are looking for a manatee named Swale that is acting ill, but he may be well enough to avoid our efforts now. He was staying in shallow water where it is easier to breathe and making an awful sound as he would inhale and exhale. Swale was in every day then started acting better and missing the count. We are still watching for him. It was a quick day. The river temp was 71° F (21.5° C). Because of the warmer weather, only 15 manatees were counted, and none were adoptees. The river temp was 70° F (21° C). Still enough cold remained to get 68 manatees into the run. Paddy Doyle, Doc, and Aqua were nice enough to show up. The low predicted temps in March I was looking forward to are now predicted to be higher. We shall see. While I was gone for four days, the following is what happened, thanks to our Multimedia Specialist Cora Berchem. On Thursday, a manatee we have wanted to help for two seasons, Lola, was captured by the Florida Fish and Wildlife Conservation Commission with assistance from the Florida Park Service and Save the Manatee Club. Lola has been transported to Miami Seaquarium for treatment. She has a terrible lung problem that affects her buoyancy and overall health. 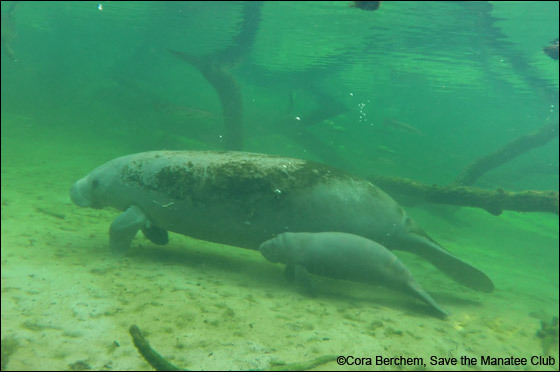 On Thursday, the park staff counted 45 manatees, but Cora’s count stopped when she came across Lola. The overnight temperatures dropped to 35° F (1.5° C) and on February 19th the park staff counted 146 manatees for the morning. Over these last four days, Cora saw Howie, Nick, Lily, Philip, Lucille, Annie and calf, Aqua, Phyllis, Doc, Lenny, and Paddy Doyle. Another manatee of concern named Swale shot out of the run as the capture of Lola got underway. He may also have problems, so we will be keeping an eye out for and on him. The river temp was 69° F (20.5° C). Because of the warmer weather, only 12 manatees were counted, and none were adoptees. The river temp was down one degree to 67° F (19.5° C). The manatee count was 46. Although many interesting manatees were present, none were adoptees! The river temp today was 68° F (20° C). I counted 31 manatees and ID’d 26 of those. None of the manatees ID’d were adoptees. The river temp was 66° F (19° C) over the weekend. The manatee counts by our Multimedia Specialist, Cora Berchem, were 93 and 80 respectively. No adoptees on Sunday, but on Saturday, Cora saw Annie and calf, Lucille, Aqua, Nick, and Floyd. Looking ahead, the first half of March might be good for manatee viewing! The river temp was 69° F (22.5° C). I was surprised to count 52 manatees. Yesterday the park staff counted 3! Saw Lucille, Annie and calf, and Floyd. The river temp today was 65° F (18.5° C), which seemed too high to me but does match the 96 manatees I saw, almost exactly half the number of manatees seen yesterday. I ID’d 56, including Lily, Doc, Floyd, and Lucille. Lucy came in late and was barely in the clear warm water where she was hard to pick out as I circled for a little extra filming. The river temp was 63° F (17° C). The fog was so bad we did not go on the run until almost 10:00 a.m. The park staff counted around 7:00 a.m. and somehow managed to see 177 manatees. We counted 179! Philip, Lily, Deep Dent, Rocket, and Annie and her calf made the count. As we floated around filming, Paddy Doyle, Doc, Howie, and Phyllis came in. Annie’s calf is usually mentioned, but if it is not, do not worry. We may see it and not mention it, or it’s off playing with the other kids! Both manatees and humans seem to feel a park is a safe place. Cora Berchem, the Club’s Multimedia Specialist, was at the park doing camera work and was able to do a couple of counts. She counted 137 manatees on Saturday and 162 on Sunday. On Saturday she saw Howie, Lily, Phyllis, Philip, Lenny, and Annie with her calf. On Sunday she found Philip, Annie, Lenny, Rocket, Aqua, and Lily. The river temp was up to 61.5° F (16.5° C) and the manatees were down to 215. No manatees were in the top three quarters of the run, but by the river I saw Lucille, Phyllis, Annie and calf, Aqua, Lily, and Rocket. Philip showed up late again! The river was still 59° F (15° C) to my surprise. I thought it would be up a little. Many manatees are leaving the run as soon as the sun comes up. They seem to feel that the warm air cancels the cold water. Only three manatees were in the top three quarters of the run. The other 301 were by the river, and I felt over half had gone out while I was paddling to the boil. I did see Nick, Lily, Deep Dent, Margarito, Phyllis, Paddy Doyle, Howie, Whiskers, and Rocket. Once the count was over, I found Doc and Philip. I also saw Aqua’s yearling Astro, so I imagine Aqua was somewhere near by! The river temp was 59° F (15° C). Down one degree from yesterday. But with the weather warming, the manatees are ready to leave. I counted 321 manatees and the park staff counted 251. The park staff counted with the mist on the water, but I waited until most of it burned off. Nick, Lily, Doc, Paddy Doyle, Lenny, Deep Dent, Lucille, Philip, Phyllis, Whiskers, Rocket, Annie, and Aqua were in the run! We did the state-wide synoptic survey today. That is when, in a two or three-day period, an attempt is made to count manatees in Florida at warm-water sites. The river temp was a more realistic 60° F (15.5° C) today. I counted 292 manatees in the steam coming off the run in the cold and felt good about it. The park staff counted 458 from the boardwalk! I think it was one of those days when being higher up than the canoe helped. When I came down the run after the count, with the fog burned off, I could see many times what I counted near the river. Not too many adoptees when so many manatees were in, but I saw Gator, Phyllis, and Lily during the count and Philip after it was over. Much later Cora, our Multimedia Specialist, saw Deep Dent, Aqua and her calf Astro, and Margarito! Dismal morning — rain, wind, and cold, but folks were up from Brazil to film, so we went out. The river was 63° F (17.5° C), which had to be influenced by the spring run coming up river to the fishing dock where I take the river temp. The river must have been colder! I had ID’d a few manatees from the observation deck, including Lily and Rocket, but once in the canoe the rain increased and I ID’d no one going up the until I saw Rocket playing in the boil. I decided to try for a plain number count on the way back down. Then the rain stopped and I counted 409 manatees! I saw Aqua, Nick, Lucille, Doc, and Margarito. Later in the day Annie came in to the webcam pole. Highest count of the season! First day of the Manatee Festival! The river dropped two degrees overnight to 63° F (17.5° C). I counted 207 manatees in a wind that was almost too much for me to be out in. I saw Philip, Lucille, Phyllis, Annie and calf, Rocket at the aluminum dock, and Aqua in the boil. With the wind down a bit, I hung around near the river in hopes of seeing more manatees, and Lenny did show up. A manatee I had not seen this season also came in! As the day went on Paddy Doyle and Lily also wandered in. The river temp was again 65 ° F (18.5° C). We saw 150 manatees, and I ID’d 71 even though the wind was bad enough to make things very difficult. Lucille and Lenny were near the hyacinth barrier at the mouth of the run. Annie and her calf were just up the run. Aqua was in the boil cavorting with 14 others. And then, as we headed toward the canoe beach, we saw Rocket, who naturally did not make the count. Manatee Festival this weekend and a little cooler weather. The river dropped three degrees to 65° F (18.5° C), and the manatees counted more than tripled! We counted 134 and ID’d 104. The adoptees in were Phyllis, Paddy Doyle, Lenny, Rocket, Aqua and, with the roll call over, Philip and Howie showed up. I did not expect much today, but it was a good day. I was expecting the river temp to be lower than the 68° F (20° C) it was. Then I was surprised to find 39 manatees. I paddled out to the river and Howie swam in under the canoe. Then when I reached the main observation deck, I found Rocket had finally made it home from the spring to our north. He has a new scar, but he is okay. I was on the water at 7:30 a.m., and I am glad as the wind was up by my regular time after 8:00 a.m. I got pictures of Rocket. On Tuesday, I did everything but the blog and did not realize it until this morning. Well here is what I should have written! The river temp was 66° F (19° C). I counted 35 manatees and ID’d 28. Philip was the lone adoptee present. Because of the few number of manatees visiting, I had enough time left to repair the canoe seat. Today the river temp was 67° F (19.5° C). I counted 22 manatees and the park staff counted 20. No adoptees were in at all because of the warmer weather. When summer in January is over next week, we should see some more manatees. I could not get out Friday or Saturday so I went out on Sunday. The river temp is up to 64° F (18° C), and you can tell. I counted 116 manatees and the park staff counted 103, down from previous counts of the 300s when the weather was cooler. The number of adoptees visiting was down as well. I only saw Lily, Philip, and Floyd. The manatee that gave birth about January 9th is named Lemon, so the calf is being called Lime by popular demand! I was surprised to get the same river temp as yesterday, 60° F (15.5° C). The manatees knew it was getting warmer as I counted 276 instead of over 300. They were further up the run but still crowded as close to the river as they could manage. Very few were up the run. 165 manatees were ID’d, and I saw Lucille, Doc, Howie, Nick, Lily, Gator, Floyd, Annie, Paddy Doyle and Phyllis. I now have 14 manatees in that were not here last season but have Blue Spring numbers. Good to see old friends that have been missed! One I thought had gone has been around all the time. I was comparing pictures and discovered Biggs was really Raja. Raja had only one ID scar, and it had blended in with some new scars to fool me into considering him a new manatee. After a little operator malfunction, I got a good river temp at the park today. It was 60° F (15.5° C). At least 150 manatees were just inside the mouth of the run, so I eased out and sat very quietly writing names as fast as I could and hoped no one would bump the canoe and get excited. Plenty of the manatees bumped me but no one got excited about it. They were doing it for fun. I counted 326 manatees and ID’d 210. I saw Lenny, Paddy Doyle, Phyllis, Howie, Annie, Nick, Lucille, Doc, Floyd, Margarito, Philip, Gator, and Aqua. Still no Robin! But many manatees are still just getting to the park. The river temperature at the park dock was 65° F (18.5° C). The run was definitely interfering with the temperature reading. I believe the temperature at Racy Point near Palatka was closer to the truth at 56° F (13.2° C). Cora Berchem, the Club’s Multimedia Specialist, and I counted 300 manatees, and I ID’d 195 of those. Big day for adoptees. We saw Lucille, Howie, Lenny, Doc, Margarito, Lily, Nick, Paddy Doyle, Gator, Whiskers, Aqua and Phyllis on the way up and Annie and Philip on the way down. I had company in on the count on Monday. A film is being made on William Bartram, an early naturalist who explored Florida, and the film will go where he went and record who and what is there now. The river temp was 65° F (18.5° C). We saw 177 manatees. Lily, Paddy Doyle, Phillip and Aqua were present. Aqua is one of the manatee that likes to go way up the run. On Tuesday, temperatures were going up. Cora Berchem, Multimedia Specialist for Save the Manatee Club, counted 94 manatees and park staff counted 96. Cora saw Annie, Phyllis, and Aqua. The river temp was only 66° F (19° C) on the 31st at Blue Spring, and 60 some miles later at Palatka it was 62° F. So the manatees crowded into the mouth of the run though a few were scattered up to the head spring. Conditions led to a count of 171 manatees, though I believe over 200 were present. Of those, 97 manatees were ID’d, but Lily was the only adoptee present. It was cold but warming very fast. A Happy New Year from Cora Berchem, the Club’s Multimedia Specialist, who did a manatee count on January 1st. Cora reported the park staff counted 266 manatees but said there may be more. Cora counted 245 and was able to ID the following adoptees: Phyllis, Nick, Annie and calf, Philip, Lucille, Lily, Gator, Aqua, Margarito, Deep Dent, Lenny, Whiskers, and MERLIN!!!!! Cora was sure there were actually at least 300 manatees in the run today! Certainly this is the most adoptees we have seen this season! And Merlin’s first Blue Spring appearance in over a year! The river temp is 71° F (21.5° C). Because of the warm weather, both the park staff and my counts were zero manatees. Two juveniles came in after the counts were over. Cora Berchem, the Club’s Multimedia Specialist, recently posted a video of an alligator checking out a manatee tag on the Club’s Facebook page. I was just watching the video clip again when I noticed Lenny in the lower right corner! It is his first appearance this season! What a nice present! The river reached 70° F (21° C) today. I counted 18 manatees. As I took the river temp from the boat tour/fishing dock at the park, Lucille’s tail stuck up out of the dark tannic water about a foot and a half! Lily was also seen. I look forward to when the river is cold enough to move the manatees farther in the run. Right now, they are spread out all over the mouth. The river temp was up to 67° F (19.5° C), but manatees are still coming in. Cora Berchem from Save the Manatee Club and I counted 158 manatees and I ID’d 126. Philip, Gator, Annie, Lily, and Aqua were all in. Philip was by the river, Aqua was in the boil, and the others were scattered in-between. Annie and her calf were in yesterday as well. I worked too fast and missed her in the list. Bad news, Rocket was not at Blue Spring as I reported yesterday. It was a manatee named Amber whose freeze brand is A9. The 9 looks like anything but 9! Good news, Monica Ross from Sea to Shore Alliance has pictures of Rocket safe in a northern spring. Click the following link for Rocket pictures taken at 1:00 p.m. on December 22nd. The river went down to 66° F (19° C) today. I ID’d 99 manatees and saw Floyd and Aqua. The park staff assured me they saw Rocket yesterday! Our little scarred orphan’s favorite nursing target is a female manatee named Huss, and her second is Amy, but this morning with both females available, she was with a manatee we just ID’d last season as Faye. Faye has her first calf this year. We have named the orphan calf Hussie. As manatees spend more time in the spring water, they get cleaner, and the silt and algae they accumulate in the river washes or get rubbed away. I was able to see that a previously unknown manatee I had designated S44/16 is actually China. China is a first time mom. Cora Berchem from Save the Manatee Club thought she may have seen another manatee named Joti some days back. Today I know I saw Joti but did not look close until I was coming back down the run after the count. The river temp remains at 69° F (20.5° C), but the damp chill air seems to bring the manatees in. Cora Berchem, the Club’s Multimedia Specialist, and I counted 79 manatees and I ID’d 61. Thank you Floyd for representing the adoptees today! With the river temp around 68° F (20° C) on Monday, Cora Berchem, Save the Manatee Club’s Multimedia Specialist, counted 21 manatees while I participated in Volusia County’s Manatee Watch training program. Lily was seen but missed the roll call. On Tuesday, the river temp was 69° F (20.5° C). The weather was so bad with cold and drizzle that 30 manatees were in, but there were no adoptees were among the 19 manatees ID’d. Large numbers of manatees that usually stay on the west side of the run are on the east side to gobble the acorns the boat-tailed grackles are knocking out of the oak trees over the run. It has truly rained acorns the last two days. It’s possibly the most nutritious item they ever eat. I’ve been sick all week but our Multimedia Specialist, Cora Berchem, has been out to the park and was able to do some counting and IDs. The river temps at Palatka rose to 66° F (19° C) from 61° F (16° C) but dropped back to 65° F (18.5° C). The manatee counts reflected the temps, being 101 and 142. Cora saw Lucille, Philip, Nick, Annie, Floyd, and Lily, but best of all she filmed Doc! Cora sent me a still picture pulled from the film clip thinking it might be Doc, and I confirmed it was. We also got picture proof that Flash returned to his favorite spring to our north after his fleeting appearance at the park. This was from Sea to Shore Alliance, who monitors manatees up that way. Cora also retrieved pictures of a youngster picked up at Palatka by the Florida Fish and Wildlife Conservation Commission’s (FWC) Northeast Marine Mammal Recovery Team. At first the youngster was coming straight to the park. Signs of cold stress were found by FWC, and the youngster was rescued and is recuperating at SeaWorld Orlando. In other health news, Una’s entangled flippers were cleaned up, and she and her calf are recuperating at SeaWorld Orlando. We are watching out for two more flipper-entangled manatees and hope to do something for them as well. Phyllis’ daughter Phalcon has a calf we are watching, so that a bunch of over enthusiastic juveniles don’t hog all the milk as happened to Annie’s calf two seasons ago. We also have an orphaned calf recently hit by a boat (a minor strike). It has been nursing on various mothers. With the calves, it is a matter of filming them to see they are not losing weight. In a previous update, I mentioned Lola having buoyancy problems. Since she survived the summer, we are just keeping an eye on her as well. Now Nato, another manatee, has come in. We never got a good look at him last season, but he seemed to be in the same state as Lola. What we need is some cold to keep everyone around. On Sunday, Cora was able to get a count as she was fixing a camera at the park. Cora counted 73 manatees and the park staff counted 75. Lucille was the only adoptee present, and she was in the process of leaving. I do not expect much activity until after Christmas. I am feeling better and hope to be out this week. As of December 16th, we have 405 manatees seen this season: 206 of those returned from last season, 8 from previous seasons, 46 calves, 99 seasonal, and 43 unknown. The river at Racy Point north of Palatka was 61° F (16° C). Too far away from Blue Spring, but it gives an idea of the river temp at Blue Spring. 61° F is the lowest reading at Racy Point this season. It was too foggy for the park staff to see anything from the bank so Cody Nolan, the park’s Assistant Manager, and Cora Berchem, our Multimedia Specialist, went together in the canoe and got the same count of 295. I like how that works. Cora ID’d 55 manatees and caught sight of Deep Dent making his first appearance for the season! Annie, Lily, Phyllis, Gator, Floyd, and Nick also made an appearance. The river remained 69° F (20.5° ) today, but the manatee count got as high as 48. Cora Berchem, Save the Manatee Club’s Multimedia Specialist, and I did an Abundance Survey for the Florida Fish and Wildlife Conservation Commission today. The Abundance Survey is a statewide count that we participate in. This involved counting the manatees three times with breaks between. First, we got 43 manatees. The next count, we got 43, but they were not all the same manatees. Some of the manatees left and others came in. The third count was 48. Of those, I ID’d 47 manatees, including Floyd and Aqua. The river is up to 69° F (20.5° C) and the manatees are down to 34 in number. I ID’d 29 of those. Paddy Doyle was lying so close to the river his head was in the dark water. Aqua and her yearling were halfway to the boil at the aluminum dock. Annie and her calf came in late. Manatees are still showing up that are new for the season. Cooler weather still in the forecast! The river has quickly come back up to 68° F (20° C). There were 102 manatees in, but with the wind and the clay they were stirring up only 50 were ID’d. I saw Philip, in a hurry to leave, Lily, Paddy Doyle, also in a hurry out, and Gator. Kirsten, another Blue Spring manatee, was swimming down the run at the surface on her back — always an interesting sight! It is supposed to be cooler again later in the week. With the river down three degrees to 67° F (19.5° C), I was disappointed the count went down to 62 manatees. I ID’d 40 of those, but there were no adoptees present. The next day was better. Cora Berchem, Save the Manatee Club’s Multimedia Specialist, counted 127 manatees and saw Lily and Nick. The river temp remained the same, 70° F (21° C), but the manatee numbers went down to 66 because of the warmer weather. I was able to ID 41 manatees, but no adoptees were in. The November summary is 376 individual manatees seen so far. 194 manatees have returned from last season, 8 from previous seasons, and there are 39 calves, 92 seasonals, and 43 unknowns. For those just joining us, “seasonals” are animals I could only hope to keep track of for the season. Unknowns are manatees that have scars for life that I should recognize, and they get Blue Spring numbers and names. The river is up to 70° F (21° C) now and the number of manatees is down to 108. Some of them are still coming in for the season and that is fun! None of today’s visitors were adoptees however. Not even dependable Annie was in. The river is up another degree, and I saw 120 manatees. The park staff counted earlier from the bank and counted 135 manatees. Nearly all of the manatees were milling around near the mouth of the spring run. Dependable Annie was in, and Whiskers made his second visit. I last saw him at the aluminum dock half way up the run today. It is rewarding to see manatees that missed last season, but today I was trying to photo and draw a very scarred manatee when I decided one scar on the tail looked like one of Amigo’s, so I looked him up on the scar chart. It was easy as his number was under 300, and I know those numbers pretty well. We are up to the 900s now! It was Amigo, last seen during the 2011-2012 season! For those of you who remember, we wanted to capture Lola for buoyancy problems late in the season last year, but she ran out on us. She survived the summer and is back at Blue Spring so her condition and possible intervention are being discussed by manatee veterinarians. The river temperature went down three degrees to 66° F (19° C) due to cooler than predicted overnight temps. So we counted 135 manatees and ID’d 108 of those. Annie was the only adoptee present. We were having fun by the river after the count waiting to see if more strangers (yes) or adoptees (no) would come in, but the wind began to blow the canoe over the manatees and getting dumped became too big a concern! I did record the first boat strike for the season. It was to a very small calf but is not dangerous. I hate seeing calves getting hit most of all. River temps going up, and the count is going down. There were 170 manatees yesterday, including Annie and Lily. Today the river was 69° F (20.5° C). The count was 110 manatees with 80 ID’d. Annie and a newly arrived Philip were the adoptees in. The unscarred young are staying around, and more manatees are coming in. The easy-to-ID old timers are going back out in the river, but more are arriving and that is good, except all those unidentifiable manatees frustrate me. We are up to 37 calves. On Tuesday, the river was down to 64° F (17.5° C). The manatees were everywhere — going up run, down run and in circles. What a challenge to count. I counted 188 manatees and ID’d 112. Brutus is in with the worst boat strike of his life but has survived it well. It is a large skeg cut on his right tail and four large propeller scars on his right flank. The water was filled with stirred up clay, but I tried for pictures. Howie flew by the canoe on his way back to the river. Nick was asleep not too far away. Whiskers was halfway to the aluminum dock. Aqua was nursing two juveniles near the boil, and Phyllis was there as well. Gator, Lily, Paddy Doyle, and Annie were also in. A manatee named Mel that has been around for years finally turned up last year with a line entanglement on his right flipper that allows us to ID him consistently. Yesterday he was in with one almost as bad as Una’s on his left flipper, so we will have to try and arrange a capture for Mel like we did for Una. Male entanglements are less common. On Wednesday, the river came down another degree to 63° F (17° C). The way the count started, I thought I would see over 300 manatees, but it was only 189. Of those, I was able to ID 125. Margarito, Lucille, and Flash came in today. Also in were Howie, Phyllis, Annie, Aqua, and Gator. Aqua still has her yearling with her. We are up to at least 31 calves. The record is 56. We have a radio-tagged manatee in that was not tagged here. That is always interesting to me. I think he is one of our young males, but he was tagged elsewhere. The river did a very quick drop to 65° F (18.5° C) and the manatees packed in. Cora Berchem, the Club’s Multimedia Specialist, and I counted 108 manatees, and the park staff counted 101 — very close. Of those, I ID’d 76 manatees. Five adoptees were in. Annie, Paddy Doyle, and Gator were seen along with first day arrivals Lily and Floyd. This is good for the first week of the season even though there are many more adoptees to appear. Lily was seen just before the season started. Floyd was just barely in the boil sleeping head downstream as is his custom. Most manatee sleep head upstream. There was no sign of a calf with Lily, and I do not believe she has one. We will keep an eye out as the calves have already reached a “herding cats” situation. The manatees seem to consider the park so safe so they let their kids run all over with little supervision. We have 23 calves now. One mother, named Mossback, had a calf last year. She may have gotten pregnant while nursing, but I think it more likely she adopted an orphan while still lactating after weaning. We have seen it before. With all that was going on Cora, Save the Manatee Club’s Multimedia Specialist, and I did not get water temps on Thursday, but the temp at Racy Point north of Palatka was 67° F (19.5° C). We counted 59 manatees and 56 were ID’d. That does indeed make the 15th the first day of the season. Among the manatees ID’d were Annie, Paddy Doyle, and Gator. If I had not mentioned it already, the three look very good. Paddy was near the boil admiring what must have been a very large female I could not ID. We found Una and her calf early and called the Florida Fish and Wildlife Conservation Commission (FWC) to initiate the capture. With the rest of the roll call completed, we watched Una until the capture team arrived. Then I stayed with Una, and Cora assisted the capture team. When the boat came up, I could tell them the calf had not been with Una for an hour and a half. When Una finally went in search of her calf, the time spent with them yesterday paid off. I could ID the calf and knew the one she met was hers. Later, when Una got out of the net, I confirmed the calf they had in the boat was hers. While Una searched the run for her calf, the net was straightened, and the next deployment caught her! She was so big, they got her out of the net onto a stretcher and slid her in the boat instead of carrying her up the steps of the board walk. She was taken to a boat ramp to load in the truck. I am told Una was very unsettled in the truck until they put the calf against her side. Then she settled right down. It was a long day, and thanks are due to FWC, Blue Spring State Park, Volusia County, our own Save the Manatee Club, and many citizen volunteers who helped keep an eye on Una as she moved around the run! We are up to 20 calves, but Lily and her daughter have not brought theirs in for the season yet. On Friday, the river was 66° F (19° C). I counted 55 manatees and ID’d 46 of those. Annie and Gator, our current ever faithful, were in. What a quiet day after yesterday! A temp of 38° F (3.5° C) is predicted Sunday night. Monday may be interesting! I counted 37 manatees so if we have more than 15 tomorrow, the 15th will be the start of the season! Of those 37, I ID’d 34 manatees. Gator and Annie were in, and Annie had her calf with her. All together, we have 14 calves so far this season. I feel a record coming on. Everyone is under notice to call the Florida Fish and Wildlife Conservation Commission recovery team if we see Una and her calf, and I did. Hopefully we will capture Una and calf tomorrow so the entanglements can be removed from her flippers. I spent several hours observing Una. All she did was try to get her calf to leave the run and get annoyed by a juvenile male. I believe Una’s little boy is a rascal. The past week, the river temp near Palatka went from 74° F (23° C) to 68° F (20° C). The park staff saw as many as 15 manatees, and Lily was among them. On Thursday the 10th, I was at the park and saw one manatee asleep at the boil. Next I saw two rushing past the aluminum dock. Another group going even faster reached the dock. They seemed to be intent on having a manatee flash mob at the boil! On the next day Cora Berchem, Save the Manatee Club’s Multimedia Specialist, and I did a roll call. The river temp at the tour boat dock was 72.5° F (22.5° C), and we were told Lily was seen in Hontoon Dead River with a calf. I hope so! We saw five manatees, but only one was recognized. The others were young and unmarked. Over the weekend, the park staff counted 16 manatees on Saturday and 19 on Sunday. They saw none yesterday. The weather looked so bad I did not go to the park. Today I was accompanied by a writer doing an article for Air Berlin Magazine. The river was 69° F (20.5° C) at the fishing dock. We counted 21 manatees. This could be the official start of the season! Manatees Marge and Amy were in with calves, so we have 11 calves reported before the season even gets started. I went to the park to film and record some narration with the Cora Berchem, Save the Manatee Club’s Multimedia Specialist. When asked how many manatees we would see, I said none. I was wrong! We saw five manatees and one was Volusia with a calf. That makes eight calves before the season even begins. The river temperature was 74° F (23.2° C). Since then the river temp went up, but now it is going down again. It looks like the manatee season may begin next week. The river is up a degree and although the park staff saw seven manatees yesterday, I saw none today. Just birds and alligators. I did get the post for transect six back in the bank of the run. Now it looks like no need to go out until mid-November. If the weather folks are right, that is! Well the season has not started, even though the park staff have seen at many as 15 manatees occasionally. As the summer finally begins to cool down, the manatees begin to come by to check the spring. Then they go back to the river and return when it really gets cold. There are no webcams up yet, but that will come soon. We’ve had six calves in the spring run in addition to Annie’s calf born in the spring run in August. That is a lot of calves to see before the season even starts! Our record is 56 calves, which was set in 2012-2013. Unfortunately, we have also lost three calves to boat strikes this off season. Spur was a young male still considered a sub adult. Decaf was a 14-year-old male and the grandson of the departed Dana. Eon was the 10-year-old daughter of Elaine and had brought us three calves. Picking these manatees out from the pictures of the dead is one of the hard parts of this job. I did a practice roll call today as it had been in the 40s over the weekend, and I needed to see if I am ready for the season. The river and the run are the same temperature, about 72.5° F (22.5° C). I saw three noses in the dark water by the river and two juveniles as I paddled up the run. So the count was five manatees! On the way down after the count, I saw Magus. He was identified last year, and it was good to see him clean and healthy with no new scars! As for being ready for the 2016-2017 season, I am there. All the transect marking posts that we use to locate the manatees along the run were present. Post six had been popped out of the ground when Hurricane Matthew took out a tree next to it. The post was floating face down where it should have been hammered into the bank. Transect zero was under water, but I cleverly hung the canoe on it as I searched for it. When I got the canoe off it, I could see a half inch sticking out of the water. The winter is the dry season, so the water level should come down. This should be a tremendous season! Wayne Hartley is a Manatee Specialist for Save the Manatee Club. Before joining the Club, he was a Park Ranger and then a Park Service Specialist with the Florida Park Service. Wayne served for over three decades as Principal Investigator for manatee research conducted at Blue Spring State Park.